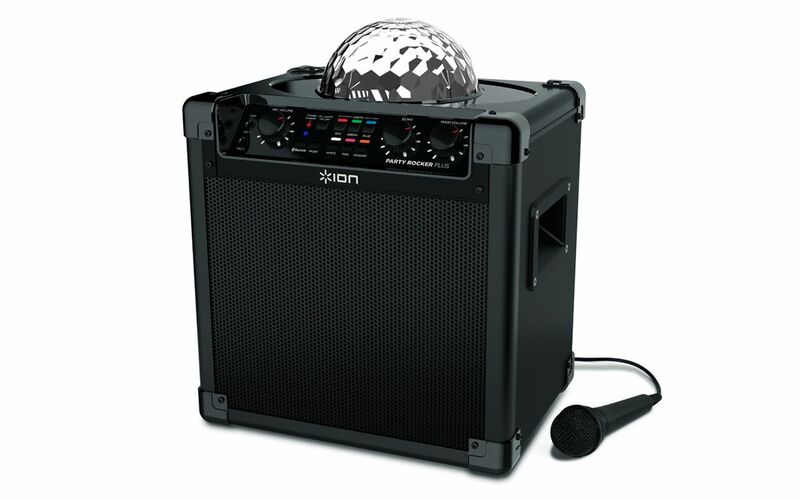 Energize your party with great sound and a room full of lights! Here’s proof that big fun comes in a not-so-big package. The Party Rocker Plus™ has everything you need to transform any get-together into a special occasion. With its powerful 6.5-inch 2-way speaker backed by a 50-watt dynamic amplifier, the sound is rich, vibrant and lifelike. Stream music wirelessly from any Bluetooth® device. The rechargeable battery lasts for hours, so your good times keep going. The spinning light dome fills your room with six dazzling colors—Red, Green, Blue, Magenta, Orange and White. The lights change pattern and pulsate in time to the music. A high-quality microphone and cable are included and Party Rocker Plus has a unique Echo Effect with dual microphone inputs so your Karaoke competitions sound like big-budget productions!